Also referred to as INFJ, INTJ, INxJ, INJ, or Introverted Intuiting personality. Integrity and independence are strong forces within Introverted Intuitives (INJ). These kids are very concerned with identifying approaches to problems that help others to grow and develop. Service-oriented, INJ children have most likely been interested in ideas that benefit the masses from an early age and were in tune with personal values and belief systems far earlier than most kids. A perfectionist who is often perceived as serious and intense, INFJ and INTJ kids have a gift for honing in on a subject of interest and will continue to develop their talents until they have reached a level of mastery. Help your INxJ work from the top-down (e.g. big idea first, then the nitty-gritty) and from the unknown to the known (e.g. hypothesis first, then proof/support). Encourage the use of examples to illustrate points in order to help draw out the details required for a high grade. Introducing your INJ child to mind maps can help clarify thoughts and provide the details that they tend to gloss over. They can also help him identify a single thread to pursue and frame the project after exploring the myriad of tangents. Your INJ enjoys the idea phase of assignments much more than the production phase. Because breadth is more interesting to your INJ than depth, be sure to reinforce when topics require more attention—particularly when it is a building block to the next topic. The consummate planner, an introverted intuitive will appreciate a recommended timeline for assignment completion rather than a single deadline and may become anxious or distressed when juggling multiple long-term assignments. Let your introverted intuitive child know when time is almost up for completing an activity (e.g. 5 minute warning). Your INJ likes to adhere to boundaries and rules and may label you “unfair” if rules are not enforced equally for all siblings. 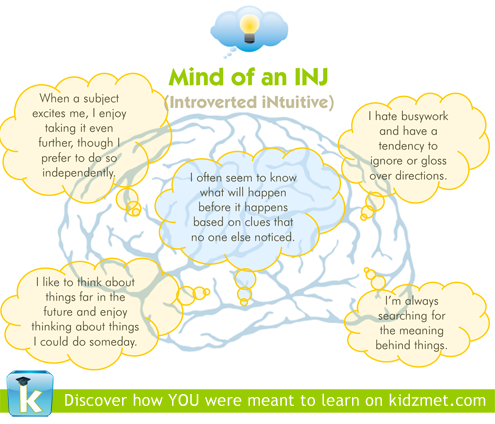 If you plan study groups for your INFJ or INTJ child, be sure to make them small or comprised of other introverts. If you are an extraverted parent working with an introverted intuitive child, be patient, as your INJ’s strength is to think through responses in their head, then offer a conclusion once they’ve formulated a complete response. An introverted intuitive child recharges their batteries with alone time. As such, allow a short window after school for your INJ to recenter before embarking upon homework assignments. However, don’t wait too long, as the pressure of looming dinnertime/bedtime can cause anxiety for her. Help your child develop completion plans for long-term assignments and, should something come up that interferes with the original plan, help them to develop an alternate one. Introducing her to tools like OpenProj or Microsoft Project can prove extremely beneficial. The greatest gift you can give an introverted intuitive child as a parent is to help develop his/her inner critic, so that he can forsee difficulties, modify his vision/inspiration and act appropriately.